Many people still use faxing and it's important to be able to send fax from your iPhone or iPad. 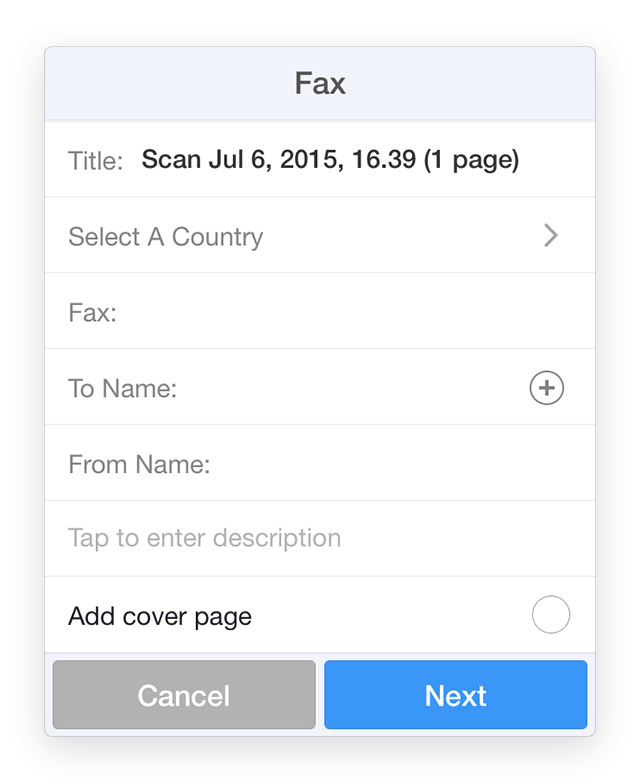 Scanner Pro can send a fax to 50+ countries around the world. To send a fax from iPhone or iPad, select the scan and tap Share. Choose Fax option, enter the recipients' credentials, fill out the fields and press Next. Note: Scanner Pro uses external fax service. The Fax Unit Pack is calculated automatically by the app based on the country of the recipient and quantity of fax pages. In most countries you can fax up to 3 pages using Fax Unit pack 1 ($0.99). Fax up to 7 pages from the US to the US will fit into Fax Unit pack 1 as well. If you need to fax up to 7 pages you will use the Fax pack Unit 2 ($1.99). If you fax more than 7 pages the app will use Fax Unit pack 5 ($4.99). Then sign in to your iTunes Store account, confirm your In-App Purchase and tap Buy.